With all the buzz about LastPass and other services you can use to help managing passwords and login information for all the websites you visit, I wanted to share my way of accomplishing the same. There are now LastPass plugins for all the major browsers out there, Chrome, FireFox and Opera, and even mobile devices. Im not saying LastPass is no-good, it looks like a nice piece of software. But, I don’t want to store my passwords at any 3rd party, even though I know LastPass uses encryption. My main browser over the last 6-7 years (version 7.something) is Opera. Opera have a feature called Wand which can remember your passwords when you sign in to websites, and it will let you log in automatically by pressing the Login key or Ctrl+Enter. The wands remembered passwords are stored in the “Opera directory”, which you can find by entering opera:about in the addressfield, and pressing enter. In this directory there is a file called wand.dat which keeps all your passwords. When you are done browsing, you unmount the truecrypt volume. You can then put your TrueCrypt volume inside your Dropbox folder, so it will be synchronized to, say, your other computer. If you don’t have Dropbox installed (or some other synchronization service) download and install it. There is a good tutorial here on how to create a TrueCrypt standalone volume, follow through the tutorial. You can create a volume of 1 MB, and create the file inside your Dropbox folder so it can easily be synchronized. Also remember to use a strong password consisting of as many upper and lower characters, numbers and symbols as possible. Now that our encrypted volume is set up, mounting and unmounting works, and the file container is beeing synchronized with Dropbox, we can move our Opera password file into it. Actually, we don’t move it yet, we copy it first, for security reasons, so we don’t screw things up if anything goes bad, or if you don’t remember your password. 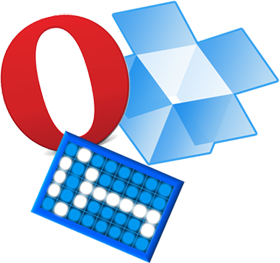 You should now be browsing with Opera using the password file from the encrypted volume. To test if it is set up properly, move the wand.dat file in your original folder ( C:\Users<username>\AppData\Roaming\Opera\Opera\wand.dat ) to your desktop or some other folder. Then restart Opera. Can you use the Wand to log in to your websites now? (Yes you should, since Opera now uses the wand.dat in the encrypted volume). The encrypted volume is set to auto-mount at computer start up, you will then be prompted for your password. Mount the encrypted volume, start Opera. Close Opera and dismount the encrypted volume. Dismount the volume, start Dropbox. Ofcourse, you can use this encrypted volume for more than just your Opera settings file, you can safely store your other sensitive data in the same volume. Every file you want to synchronize or keep on your multiuser laptop, and still keep the data private, just put it in the volume.